The Middle Alabama Area Agency on Aging (M4A) is working with St. Clair county community leaders to launch a Senior Meal Challenge to help feed senior citizens across the county. 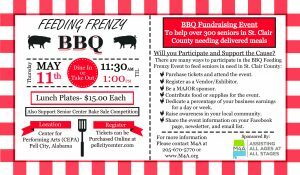 The first annual “Feeding Frenzy” fundraising BBQ luncheon event will be held on Thursday, May 11th 2017 at the Center for Education & Performing Arts (CEPA) in Pell City from 11:30 – 1:00 pm. The cost per plate is $15.00 and all proceeds from the event will go to feed St. Clair county Seniors. Over 300 homebound seniors in St. Clair county are still on a waiting list to receive meals under M4A’s Elderly Nutrition Program. Most of these seniors are on a very limited income, unable to leave their home, and are in great need to have nutritious meals. We encourage you to take the Senior Meal challenge and attend the event. If you would like more information about the Senior Meal Challenge please click HERE.